A love for playing and watching football drew Pim van der Hoorn to a job with the Royal Dutch Football Association (KNVB), where he now works as a marketer and product manager. Together with colleagues, he quickly put his savvy marketing skills to use developing Kicks – a low-commitment pickup football program that’s perfect for busy expats who might not be able to commit to the rigorous schedule and membership fees of a traditional football club. Pim dropped by to tell us about this new program, to tell us what it’s really like to work for a world-class football organization, and to offer Expat Republic readers a chance to try out Kicks for free. The KNVB is an organization steeped in history. Founded in 1889, it organizes all aspects of football in the Netherlands; from fifth-class amateur leagues all the way up to the top-flight Eredivisie, and of course the orange-clad national team. It does all of this with a surprisingly lean team. “We organize around 30,000 official matches every weekend. There are only around 300 people working for the KNVB, so there’s a lot of work and a lot of responsibilities,” said Pim. “Since football is very popular in the Netherlands, we have this saying that there are 16 million professional coaches in this country, and they all have an opinion about football and the KNVB, so everything we do is under a microscope,” he continued. “Since the organization carries such responsibilities, it relies on safe, traditional patterns to ensure everything runs smoothly,” Pim told us. But for such a venerable institution, the KNVB is surprisingly dynamic and open to change. Before taking up his current role, Pim worked for Heinz, famous for its ketchup. He found the job extremely commercial and straight-laced: The typical American corporation. As well as a change in workplace culture, Pim wanted to do something more rewarding. “Encouraging people to play sports is good, encouraging people to buy ketchup is not helping society a lot,” he told us with a smile. At the KNVB, working life is less rigid. Offices are open, fitness facilities are top-notch, and there’s far less separation between the higher-ups and workers. This openness to fresh ideas led the KNVB to develop Kicks. Pim explained how the program aims to revitalize football in the Netherlands at a grassroots level. “One of the problems with how football is organized in the Netherlands today is that it’s hard to start playing by yourself, if you’re an expat or someone who has moved to a new city or town to work. You would need to find a club, or have footballing friends to get started,” he said. Joining a traditional football club can also be too big of a commitment to balance with work and family life. That’s where Kicks comes in. 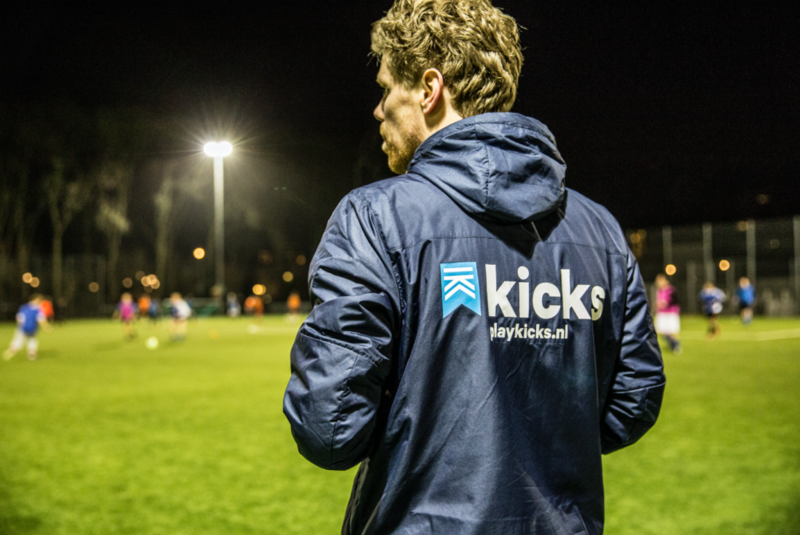 Kicks lets people book and pay for open training sessions online on a once-off basis. 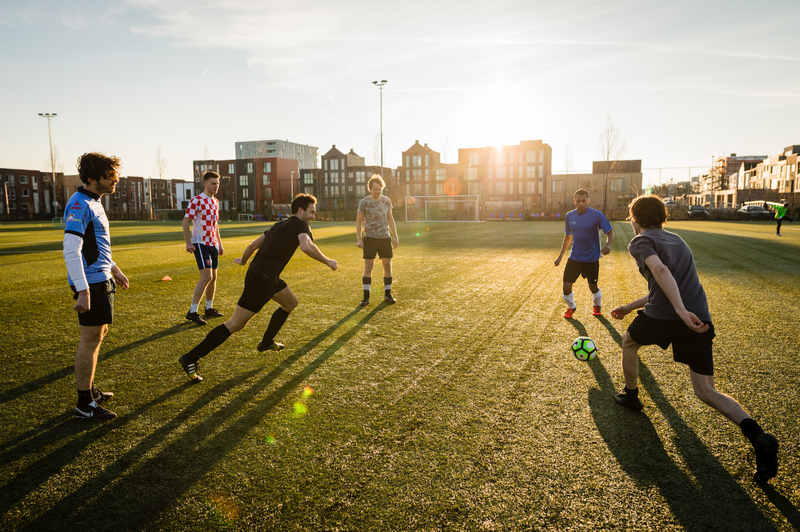 Training takes place at local football clubs, and all you need to do is turn up in your football gear: perfect for expats who want to play hassle-free football with like-minded people. This is possible thanks to the KNVB’s extensive footballing infrastructure. The Netherlands is full of great pitches. In most places, there’s a pitch less than 15 minutes from your home. Training sessions are organized and overseen by a Kicks-coach, who ensures balanced teams and guarantees a night of fast and exciting football. “If you want, we can make you a better player, but we know that a lot of people just want to have fun on the pitch, so we’re not going to have you doing push-ups and pull-ups,” Pim told us. Instead, you’ll play lots of fast-paced matches, and the coaches rotate and switch sides to ensure level but challenging games. High-quality balls, gear, and playing and changing facilities are provided, and with an astounding 3,000 KNVB clubs nationwide, there’s always somewhere nearby to play. In Amsterdam for example, there are six clubs to play at, and 11 open training sessions every week. As of now, Kicks is available in Amsterdam and Utrecht, but Pim and his team are currently working on expanding to new cities and towns across the Netherlands. For Pim, Kicks’ success will be judged by the Netherlands’ 16 million professional coaches. No pressure. Curious about Kicks and want to try it out? Kicks is giving away free training sessions for Expat Republic members and their friends. Click here to find out more and book a free training session right away. 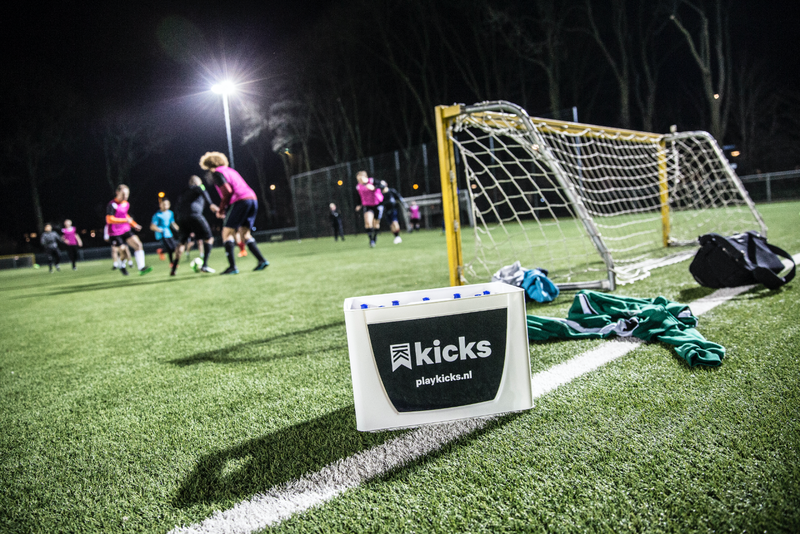 You can also reach Pim by email at pim@kicksvoetbal.nl or by WhatsApp at 06 5537 7362.